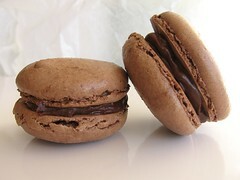 Chocolate Macarons - Do You Know The Muffin Man? Notes: After reading so much about them via food bloggers, I finally had a chance to sample macarons while in Hong Kong at Le Goûter Bernardaud. They really are as good as everyone says they are. For my first attempt, I tried the chocolate macarons recipe from David Lebovitz. His batter is far stiffer than other ones I've seen online, e.g. Clement's: this made piping very easy although the tops weren't perfectly smooth. The first tray I made were about one inch across and most of them cracked. I piped the second tray a bit larger and baked them at 350°F: these had more pronounced feet and fewer cracked tops. The final tray were the largest and these were the best looking: nice frilly feet, and smooth tops with no cracking. For the filling, I used some ganache I had in the freezer (although Lebovitz' chocolate and prune combo sounds good). These cookies were fantastic for my first try: nice crisp, eggshell exterior and soft, chewy middle. The flavour of the cookie is a bit strange, raw and unrefined. It may be the cocoa powder I was using (Cocoa Camino organic) or the almond meal (bulk, from Whole Foods). I'm pleased they were fairly simple to make, as buying these on a regular basis would be prohibitively expensive.